I confess that spending an entire morning looking at dresses isn’t my idea of fun. But this was different. The Bowes Museum, the imposing French-style chateau that’s one of our region’s most stately assets, is currently [September 2015] playing host to the UK’s first Yves Saint Laurent retrospective. Despite my reluctance, Mrs Diner wouldn’t take no for an answer, and I’m really glad she dragged me there – even though she complained all the way down about my outfit. I thought: if double denim is good enough for Jeremy Clarkson, then it’s fine for Barnard Castle. Apparently it’s not. I may have arrived as a fashion disaster, but I came away with a rare insight into a supremely creative French mind. You have until 25th October to check out a very good exhibition. Later, as we meandered through the permanent collections, I felt my eye drawn to the Flemish still lifes, bursting with muscular fruit and vegetables – my thoughts were turning, inevitably, to hunger and lunch. I wanted to keep the French theme going, and the closest opportunity (13 minutes by satnav from the museum) was the Bridgewater Arms in Winston, where the menu offered by Chef Paul Grundy is full of solid French technique and the books on the shelves of the lounge bar tell of the regional cookery of that country. 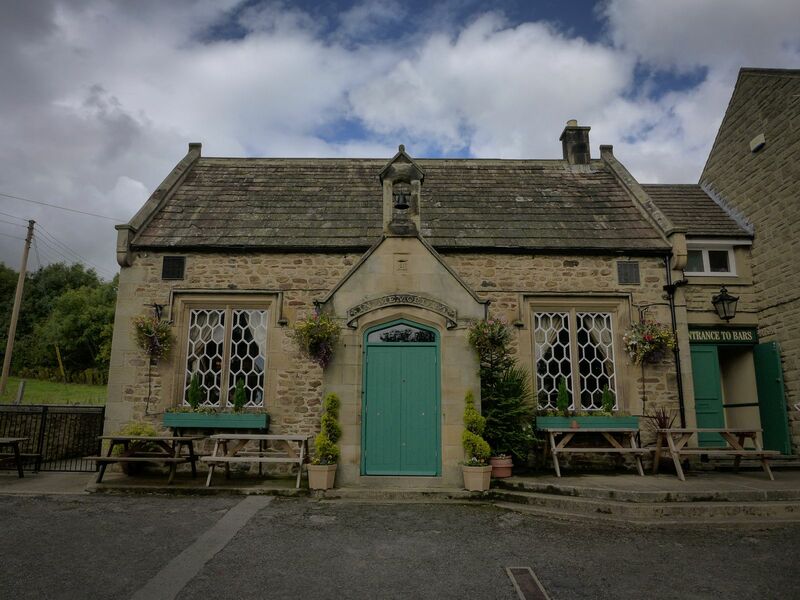 But his ingredients are as British as the building itself, an old Victorian school house, with its stone façade and school bell on the roof. In these difficult economic times, it’s nice to find a good news story about a pub. Grundy had been chef-proprietor at this place for 5 years, when in 2013 the brewery hiked the rent so much that he had to quit. One regular, a local businessman, was so upset, he bought the place, and reinstalled Grundy and all the staff. Nice. 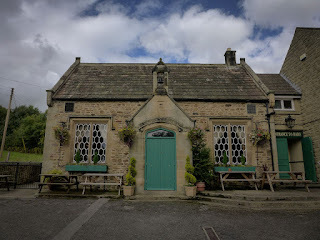 Sat in the bar area, we had a lovely view through the leaded windows to the surrounding fields. 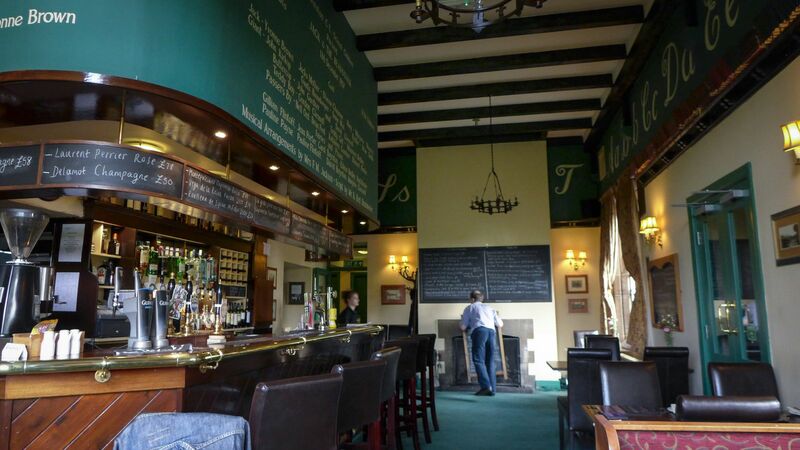 On the walls are painted the names of the cast of an old school production and the menu is written on chalkboards. This place is best known for its seafood, and there’s a large selection, though they also offer a number of meat dishes. 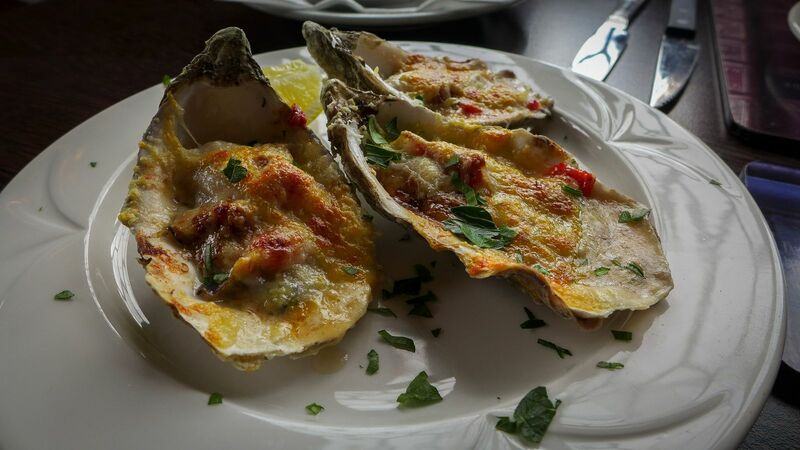 We eased our way in with a few oysters, grilled Kirkpatrick-style with bacon, cheese and enough spice from the Worcester Sauce and chilli to pep them up without losing the essence of the sea. 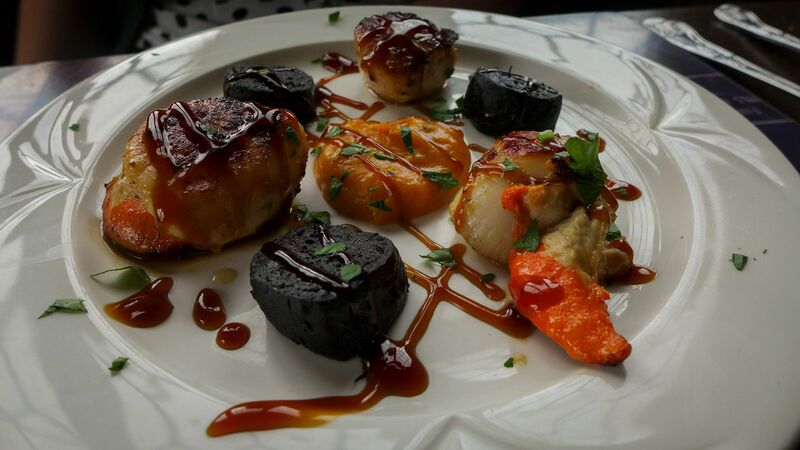 Mrs Diner’s starter paired properly caramelised roe-on scallops with some delicious black pudding, which is always a good idea. The sweet potato purée and oyster sauce that adorned them was a less familiar pairing, but they worked really well, adding muskiness and umami. 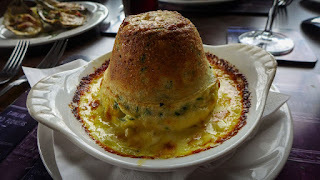 Meanwhile, my cheese and spinach soufflé was a twice-baked thing of wonder, a light-as-a-cumulus orb floating in a densely tangy cheese sauce. The contrast was a joy, the whole thing a thrilling demonstration of what can occur when good ingredients meet great technique. An off-dry Petite Gasconne from a good house wine selection worked wonders too. Our mains struggled to maintain this gilt-edged standard. My lamb’s liver was just a touch overcooked; Mrs Diner’s confit duck leg had fine flavour but the skin wasn’t crisped up. I guess we should have stuck with the fish. 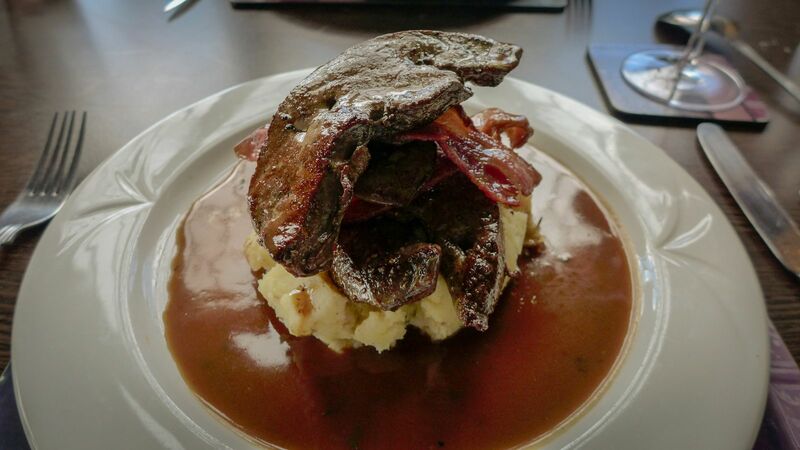 In both cases our meat sat astride a pile of well-seasoned mash, surrounded by a red wine sauce, reduced to the point where it shone. Something pickled or sharp would have cut through the richness of both these plates, though mine was helped on by a suitably gutsy Sangiovese. 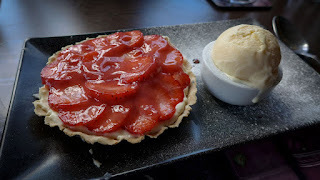 Desserts, like the mains, were more “pas mal” than “mon Dieu!” My strawberry tart sported berries that lacked a little oomph, layered over a decent crème patissière and passable pastry. 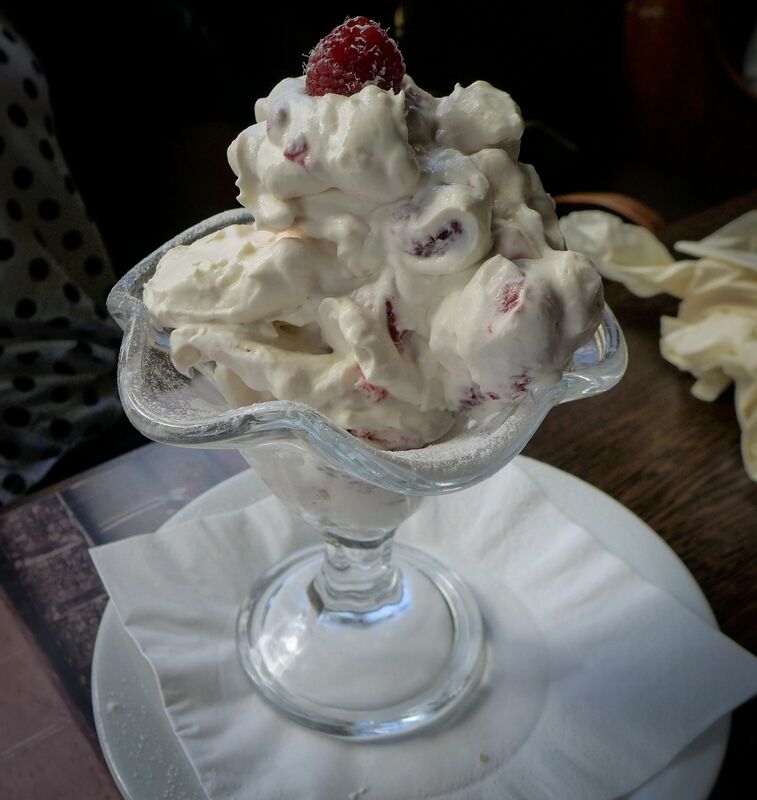 Better was Mrs Diner’s Eton Mess, which arrived in a pleasingly retro knickerbocker glory glass and benefited from some tangy raspberries. “Meringues could be a bit chewier” came the call, although I personally enjoyed the crunch against the billows of whipped cream. A punchy espresso brought to a close a meal that threatened to be really superb before settling in to merely “very good”. Hence, three stars not four. 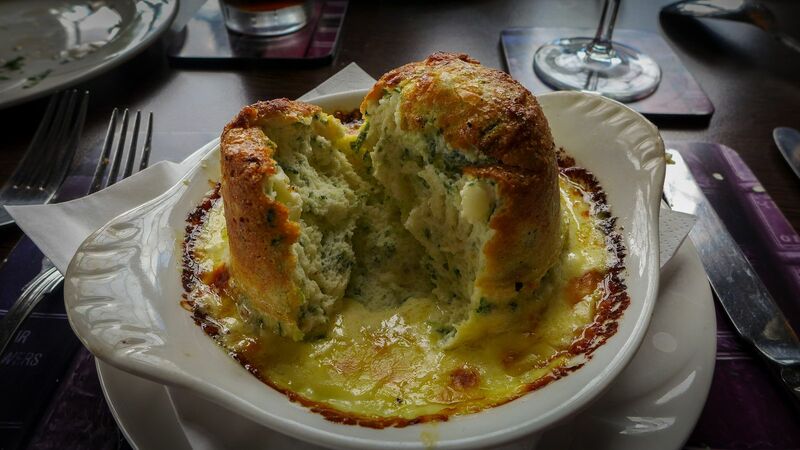 Paul Grundy is clearly a fine cook, who writes a menu full of good sense, with honest, high quality ingredients. The villagers are lucky to have him. Service from the three staff manning the bar was well-informed and charming all round. I’d be interested to return for dinner, which is served in a pleasant dining room next door. 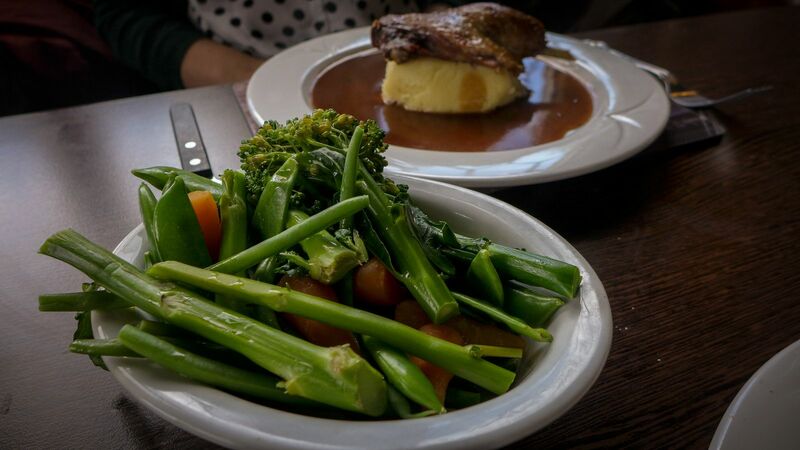 Despite ordering relatively modest main courses, our bill ran to just over £80. Not your everyday pub lunch, then. And rather more than you’d pay in France.